"Douzinas stands among the handful of academics who have seen a duty to use both their position and analytical skills to convey the message of resistance to an international audience. He cannot be commended enough." "Douzinas' writings form an exciting entry point into the critical theories that are coming to grips with the age we live in. By asking if another world is possible, Douzinas presents some hope that the rebellion against austerity is perhaps a sign of a more democratic and equitable Europe to come." "Solidarity with the hardships imposed on the Greek people by the agents of the financial capital is not enough - one has to start THINKING about Greece today. This is what Costas Douzinas does in Philosophy and Resistance in the Crisis - he treats Greece as a symptom of what is wrong in today's global capitalism, and as a lesson in how the people should resist the fate imposed on them by global capitalism. This is not a book about the exotic case of Greece - it is a book about all of us, which is why we all should also read it!" "In a passionate revival of the classical concept of fearless speech, Douzinas offers a cri de coeur for intellectual engagement and ethical responsibility in the face of the Eurozone crisis. Counterposing Greek philosophy to the Greek statistics of the money managers he makes an urbane argument for rethinking the concept of Europe at the site of its original inception." "Read this book. Douzinas opens a new terrain for critical theory, a much needed terrain in theses times of new insurgencies across the world. Beautifully written and carefully argued Douzinas offers us a profound rethinking of major concepts of critical theory as we now confront a new era of mass up risings." A timely and provocative book on the current crisis in Europe by a leading radical thinker. 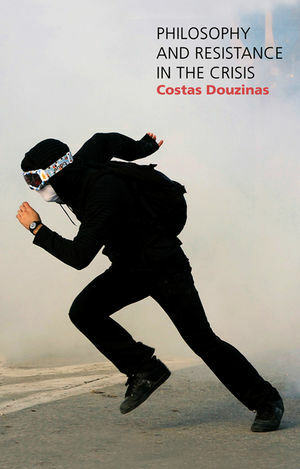 Douzinas uses radical political theory to analyse the current protests in Greece and elsewhere as spontaneous and leaderless events that disrupt political settlements imposed from above and attest to the will to resist Ð a persevering trait of the human spirit. He argues that Greece, the birthplace of democracy, has once again become a key testing ground for democracy, as popular resistance to the austerity package imposed on Greece leads to new forms of contestation and struggle. Written by an author who is well known for his commentaries on the situation in Greece, this book will find a wide readership among all who are interested in the crisis of Europe and the new forms of politics and resistance that are emerging in Europe and elsewhere.